Traci Stanton's dream is to own a cake shop. The cramped kitchen at her Heart's Haven apartment isn't exactly an ideal space for creating her masterpieces. Plus her new neighbor, Dylan, has become a constant distraction with his DJ business and the ever-present explosion of event music as he tweaks playlists. Dylan Jones blew into Angel Falls like a hurricane desperate to leave the memories of a mission gone awry. A former Navy SEAL, he's got no desire to live with deadlines and boundaries or to take orders from anyone--ever again. If only Traci would quit distracting him with the aroma of her sweet confections and lilting voice singing hymns as she works. Dylan has no place for the God who let him down and claimed the life of his fellow SEALs. Will Dylan ever leave the past--and his anorexic faith--behind and allow God to calm the raging storm in his soul? The mellow blend of Vivaldi’s violin concerto flowed from an under-the-cabinet radio to soothe Traci Stanton’s senses. Through the cottage’s open patio doors a gentle breeze carried the scent of pine from the majestic Angelina Forest while birds chattered beneath a golden halo of evening sun. The Easter holiday was behind her and summer closed in with its promise to bloom to full glory. Grape hyacinth drifted from the grounds along Heart’s Haven where it had been planted in preparation for Kaci and Ryne’s wedding, scheduled to take place on the lawn of the Big House in only a few weeks. But, for now, Traci was elbow deep in preparations for more imminent nuptials—a wedding scheduled for tomorrow afternoon. And the cake she’d promised the lovely couple could be no less than perfect. Her reputation depended on the creation of an amazing confection. She eased into the table ledge, gnawing her lower lip with concentration as she began to slice the final curve of a rose petal from gold-dusted fondant. Humming along to the music, she took great care in this final step, already imagining the beauty of the finished product. And not just a product that stood perfect in appearance, but in flavor, as well. The rich, sweet aroma of buttercream mingled with nature scents from the rain-kissed forest beyond the Heart’s Haven complex, causing her belly to rumble with need. Once again she’d worked straight through dinner, but the one-of-a-kind creation on the table was worth it. The wedding cake was breathtaking as it rose toward the ceiling in three generous tiers. Traci had a good idea now of how she’d tackle a cake for Ryne and Kaci. The flavor they’d selected was different from the cake here, but the design Kaci had requested was quite similar. As soon as she finished, Traci planned to snap a few photos to share with Kaci the next time she saw her. The cake, in all its glory, was a perfect example of the work for which Traci had a passion. Her most elaborate creation to date, the masterful confection was sure to be the hit of the sweets table at tomorrow’s wedding reception, as well as its twin at Ryne and Kaci’s in just a few weeks. A screech shattered the calm like a freight train bearing down on the cottage. The walls of the modest structure shook and seemed to close in on Traci as the tile beneath her feet shuddered. She released a squeal of surprise and leaped back from the chaos, raising both hands to shield herself from an impending impact as the sound intensified. No crash came as the roar continued to rush over her in a cacophonous tsunami of waves. She clapped her hands over her ears to muffle the sound and doubled over, trying to make sense of the noise as her heart pounded its way back into her chest. Then a sickening sense of dread swept through. The cake. Oh, no…the cake. Skewered in the cake’s second tier like a launched harpoon. But, peering through pried-open eyes, Traci saw that wasn’t the worst of it. Oh, no siree. The once-beautiful cake had shifted from the center of the table. It listed like the Leaning Tower of Pisa, while a hideous, dart-shaped appendage gaped from the middle tier. Spring foam seemed to pulsate in time to the roar that she now recognized as the distorted thumping of music with way too much base overflowing from the cottage next door. She sucked in a breath and rushed through the back doors and onto the patio, gaping at the cottage as the rush of music grew like an angry tempest. Traci stifled a screech of fury while the offensive downbeat continued its assault on her senses, crushing the mellow strains of Vivaldi. She gaped through the living room window at the dark-haired guy whose head bobbed in time to the backbeat as music raged from doors along his patio thrown wide open to the evening. His hair cascaded across piercing blue eyes as he glanced up through the window, noticed her watching, and flashed a smile as if all was just perfect with the world. He obviously didn’t have a clue as to the havoc he wreaked. Traci started to shout, but her voice was drowned by the shattering base. She fisted her hands as her blood pressure took on the qualities of a sputtering pressure cooker. Marching back to her kitchen, she surveyed the impaled tool, the ruined fondant leaf, and the leaning tower of buttercream. Her vision fogged as her temper exploded to a flash fire, and for the slightest moment, she understood the term temporary insanity. The cake was beyond ruined. It was…an eruption of sugar and fondant. She’d have to start from scratch, and it was already closing in on six-thirty. Tears of fury burned Traci’s eyes as a profound sense of defeat set in. She began to calculate the cost of new supplies, to take a mental inventory of what she had on hand and what she’d need to run out and purchase. Tears spilled over. The cost would set her back in the red tonight; she wouldn’t make a penny on this project. And she’d been counting on the money to add to her buy-a-shop coffers. Every little bit helped as she inched closer to the goal line of owning her own cake and pastry shop. Add to that the cost of headache-relief medication, and she was completely done in. A rose leaf crafted of summer-green fondant slipped from the cake to plop onto the flour-dusted table. Others followed, one after the other, like a slow-moving rain shower…plop, plop, plop. Then, as Traci gaped in horror, the cake’s top tier slipped and splatted along the floor as if it waved a final white flag of surrender. Her internal pressure cooker exploded. Now, look what that idiot has done. The outrageous downbeat mocked her, punctuating each heated thought. 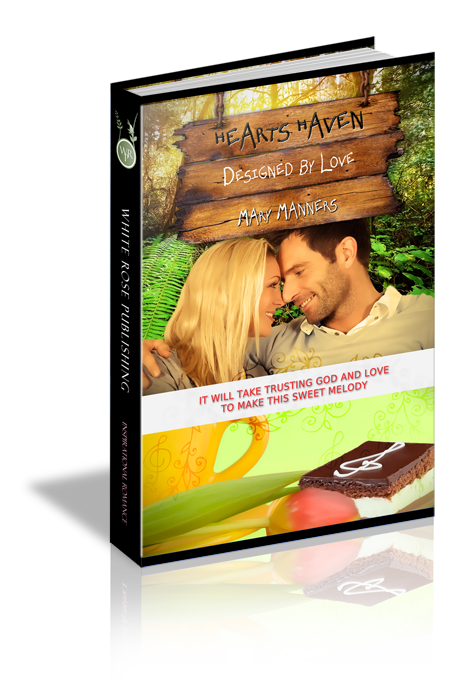 Traci’s heart ached with the loss of crusty but loveable Andrew Hart, adding to her angst. The heart attack that had claimed him was sudden and unexpected and had left everyone in the complex reeling. The mood had been somber along the cottages until a week ago. A week ago to the day—she’d noted it in her journal—was when Mr. Ear-splitter-Dylan Jones had shattered Heart’s Haven’s peace and quiet with his infernal hip-hop jams. Traci wondered that no one seemed to mind his music besides her. Had they all gone deaf? Of course, she lived closest—right next door. Ugh, at least Dylan could blast some decent tunes like the strains of her Vivaldi or Beethoven—something not quite so offensive to the ears even when it was played at maximum volume. She’d tried to be patient but enough was enough! Traci swiped her hands on the bib of her apron and blew a strand of blonde hair from her smoldering eyes. She slammed the patio doors to garner some relief from the discordant pandemonium but the kitchen yawned with unbearable heat from an oven that had worked overtime through the day. She’d worked overtime, as well. The cake business that she’d embarked on as a little on-the-side venture had quickly exploded into something way beyond her wildest imagination. People who tasted her wares insisted she had the golden touch when it came to designing, baking, and decorating cakes, and customers traveled from all points in and around the greater Angel Falls area to place their orders. If business kept pace, Traci would soon have enough money saved to open a real, bona fide bake shop, making the work from her severely undersized kitchen in the modest Heart’s Haven cottage—and the infernal cacophony of sounds that blasted from next door—a thing of the past. But, until that day arrived, Dylan Jones would just have to tone it down to a low roar. Traci refused to work under such conditions and this was, after all, the quiet little community of Heart’s Haven. Correction—it used to be a quiet little community until Blast-it Jones arrived. It was about time she put a stop to the insanity. Yes, her new yahoo of a neighbor had earned a piece of her mind and if no one else would take the bull by the horns then she’d personally deliver it up on a platter with all the trimmings. She’d make Dylan Jones see things her way, like it or not. This was the last time he’d infringe on her peace and quiet, not to mention destroy more of her painstakingly constructed cakes. The music—if it could even be called that—freight train was about to be derailed. Dylan Jones grimaced as violin music drifted through the open door of his cottage. It wasn’t the tune that bothered him as much as the accompanying melodic hum of an angel. That’s how he thought of Traci Stanton since he’d met her coming up the walk last week while moving his stuff into the cottage next to hers—a snooty angel. And darned cute…way too cute for his own good. Which he supposed was sort of a paradox, to be so beautifully angelic in appearance yet harbor a vicious bite of attitude that seemed to be directed, for no reason he could fathom, at Dylan himself. He’d wanted to get away from people…from memories that seemed to haunt him since he’d returned from his tour overseas. No longer on active duty, he wanted nothing more than to drown out the destruction he’d witnessed, including the death of his best friend, Joe, who’d gone on tour alongside him. Thoughts tumbled over each other as he forced memories from the forefront of his mind. He didn’t want to think, didn’t want to feel. Hard to manage when the alluring woman next store, with the voice of an angel, nudged something awake inside of him. Only the music could take him away, make him mindless. Dylan switched on his laptop, launched the sound mixer and cranked up the speaker volume to drown out the angel’s voice as, despite his best efforts, his first prickly encounter with Traci Stanton came rushing back to fill his mind. “Hi there, neighbor,” he’d called, figuring it was as good an ice-breaker as anything. “Traci…Traci Stanton. And again I’ll ask, what’s that?” She jabbed a finger at the thin, rectangular box on his shoulder as the blonde hair she’d fashioned into a ponytail bobbed to sweep over her shoulders. “One—it’s compound. Look it up.” Traci had stepped aside then, revealing the sign over the entrance to his cottage. Emblazoned in the wood was the message, May love find all who enter here. The same sign and message, he noticed, adorned the entrance to Traci’s cottage, as well. He’d heard through the grapevine that she’d lived here at Heart’s Haven going on a year and had yet to find her Romeo. With such a charming attitude—not—it was no wonder the guys hadn’t come flocking. Crash and burn…heartache and broken dreams. In the military, he’d seen it time and time again. Deployment, months away from a wife and kids, took its toll on a marriage. Some survived intact; many didn’t. Daunting statistics, to say the least. Nope. Not here, with this uptight blonde dynamo for a neighbor. She was well on her way to crushing the Heart’s Haven batting average, and he was sure to follow in her footsteps to trounce the legend. A sharp rap on the front door followed by a heated shout drew Dylan back to the present. His right hand went to his hip while his senses launched into full alert as a shadow crossed the window. One heartbeat, two, while he gathered his wits. His pulse pounded like a string of gunshots. Strike that. A closer look through the window glass told Dylan maybe it was the enemy…clad in faded jeans and a flour-dusted T-shirt with a mass of blonde hair gathered atop her head. He strode to the door, switched on the porch light against the waning sun and there she stood—Traci Stanton. Dylan swore he could hear his heart thumping. Or, was that Traci’s heart galloping across the room? He gaped at the power cord as she tossed it on the floor and gave it a single swift kick with the toe of her pink tennis shoe. Traci turned to face him, her cheeks flushed with fury. “I’m restoring sanity to the complex.” Both hands fisted along her sides, she reminded him of a tea kettle about to shriek…a very lovely tea kettle. “That’s right.” Dylan shrugged as he ambled toward the front door. “You…you…” Traci dropped his hand as if she’d been burned and swiped her palm along the front of her apron. Question 1: Designed by Love is based on Isaiah 40:29-31. Specifically, what does the passage, "They will soar on wings like eagles; they will not grow weary..." mean to you? Question 2: How does the story's opening scene foreshadow the impending conflict between Dylan and Traci? Do you think people who are so different can find middle ground? Question 3: How does the kitchen scene in which Dylan wears an apron lighten the mood? What does it foreshadow? Question 4: Dylan states that Traci is, "A bit judgemental." Do you think this is true? Why or why not? Question 5: What is the impact of Miss Vivian's visit on both Taci and Dylan? How does this move the story forward? Question 6: Dylan tells Traci to, "Live a little dangerously." Do you agree or disagree with this advice? Why? Question 7: Describe the pendant Traci receives, including the Bible verse enclosed with the gift. What is the purpose of both? What is the impact? Question 8: Describe the urgent messages both Taci and Dylan hear as the storm sweeps through. How might these messages be explained? Question 9: What do you think the future holds for Dylan and Traci? Explain.